Ayyubid Dynasty founder Saladin ordered this citadel built in 1176 to unite the cities of Cairo and Fustat, and also to provide a key point of defense against the Crusaders in the capital of his new caliphate. Sitting on a hill overlooking Cairo, the citadel was the seat of government for the rulers of Egypt for over 600 years. 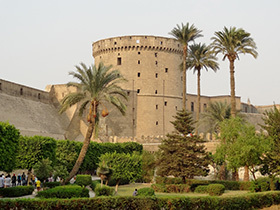 The Citadel of Cairo has undergone numerous renovations and rearrangements over the centuries. The most radical changes began in 1828 when Muhammad Ali Pasha razed some of the existing structures, rearranged the interior, and had his massive, eponymous mosque built. The citadel’s buildings still dominate the Cairo skyline, and the site is home to three museums today, including one, the Al-Gawhara Palace Museum, commissioned by Muhammad Ali in 1814. Rabbat, Nasser O. The Citadel of Cairo – A New Interpretation of Royal Mamluk Architecture. E.J. Brill, Leiden. 1995.